The Upper Pierre Street Commercial Historic District is important as the center of commerce in Pierre after 1900 and for its association with two prominent businessmen, Andrew C. Brink and Charles Hyde. The district includes the Brink and Mundt Buildings, named for the men who ran land and insurance businesses in the buildings, which both date from 1895, and the five buildings Charles Hyde constructed between 1906 and 1909. All seven of the district’s buildings are symbols of Pierre’s late-19th century pioneer architecture and early-20th century commercial progress. The buildings have simple Classical Revival details with the exception of the Brink Building, which is refaced with a much higher style Classical façade. When Pierre was platted in 1880, construction was basically limited to the flood plain. The heights of storefronts were all different because of the variances in the grade. The 1906 addition of Upper Pierre Street allowed downtown to install a gravity sewage system for drainage in times of high water. The grading of the flat and hill at the same time was one of Pierre’s largest construction undertakings. The excess dirt resulting from grading Upper Pierre Street became infill in the flat. Concrete sidewalks were installed on Pierre Street up to Capitol Avenue. This project helped create unified storefronts and greatly improved the aesthetics of downtown. 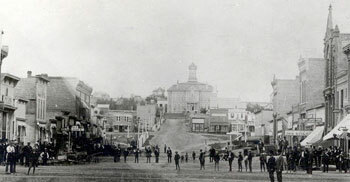 The intersection of Capitol Avenue and Pierre Street became the commercial center of Pierre after 1900 thanks to Andrew C. Brink and Charles Hyde. Andrew C. Brink was involved in both A. C. Brink & Co. (wholesale) and Brink & Tollinger (retail) flour and seed commission merchant businesses in the 1890’s. He also worked as a building contractor. He also became one of the city’s most prominent real estate men and ran the A. C. Brink Land Company and the Permanent Concrete Construction Company out of the Brink Building for many years. The Brink Building at 117 South Pierre Street is a two-story coursed brick building with a front façade of stone block imitating marble. The Brink Building and the red brick Mundt Building at 115 South Pierre Street both date from 1895. These are the only two buildings that still exist of the early business development on Upper Pierre Street that predated Charles Hyde’s involvement in the district. Charles Hyde was an entrepreneur, real estate dealer, and promoter, who settled in Pierre in 1887. Born in Illinois in 1860, Hyde worked as a detective, reporter, cattle hand, and semi-professional roller skater before his move to real estate. He also made his fortune from founding the American Exchange Bank in 1907 and from ranching. Hyde built several businesses along Lower Pierre Street before developing the commercial district on Upper Pierre Street. Many envious people, particularly in the flat district, disliked Mr. Hyde because of his success and because they opposed development of the Upper Pierre Street District on the hill. Hyde’s first building in the Upper Pierre Street Historic District was the Hyde Block at 101 South Pierre Street that Jeffers & Henry, architects out of Aberdeen, designed in 1906. The first businesses in the building included a drugstore, bank, hairdresser, restaurant, jewelry store, and a grocery store. Hyde did his own contracting on the next two buildings--The Mallery Store at 105 South Pierre Street and the Grand Opera House at 109 South Pierre Street. The Mallery Store, later known as Moore’s Department Store and also as London’s, dates from 1906. Its original owner was John E. Mallery, who sold dry goods, shoes, and ladies-ready-to-wear apparel after moving from Wisconsin to Pierre in 1882, where he succeeded in the new prestigious business district. The Mallery Store is located between the Hyde Block and the Grand Opera House and differs from those buildings because of its large glass display windows and two doorways in a recessed entrance. The Grand Opera House once contained 1200 seats and had ornate decorations and lush stage curtains. The opera house was extremely popular in the community of Pierre, drawing audiences with such shows as “Clint and Bessie” and various Shakespeare performances. In 1917, there was a decline in theatre popularity that forced the owners to transform the Grand Opera House into a movie theatre in 1919. Movie theatres were becoming increasingly popular by that time. Known as “The Grand Theatre,” the new movie theatre matched the popularity of the old Grand Opera House. The movie theatre closed in the late 1960s due to competition with the new State Theatre and the Sioux Drive-in. 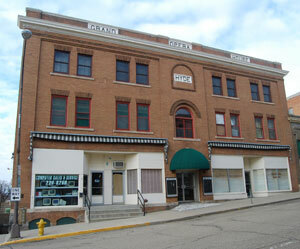 The Grand Opera House is again a live theatre, home to the Pierre Players, a local theatre group. In 1908, Kansas City architect P.R. Johnson designed the Capitol Avenue Block at 105 ½ East Capitol Avenue, also known as the Capitol Hotel. Among the first businesses in the Capitol Avenue Block were a hardware store, grocery store, a boots and shoes store, furniture store, and a dry cleaning business. The Pierre Street Block at 101 ½ East Capitol Avenue and 108 ½ South Pierre Street dates from 1909. Some of the earliest of the many businesses housed there over the years were a department store, bank, jewelry store, motion picture theatre, a plumbing service, a boots and shoes store, and a Christian Science Reading Room. The Hyde buildings are all constructed of red or brown brick and have Classical Revival details. The buildings are either two or three stories, except for the one-story Moore’s Department Store. Four of the five Hyde buildings have projecting pressed metal cornices decorated with dentil molding along the street facing facades. They are grouped along Capitol Avenue and the north end of Pierre Street. The Upper Pierre Street Commercial Historic District is located on the corners of Pierre St. and Capitol Ave. in Pierre. Most of the buildings in the district house businesses on the first levels and apartments on the upper levels. 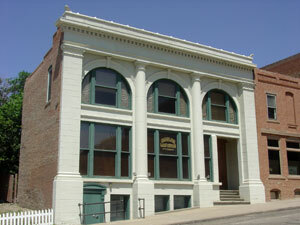 The Pierre Players Community Theatre in the Grand Opera House at 109 S. Pierre St. put on shows throughout the year. For show and ticket information call the box office at 605-224-7826 or visit the Pierre Players Community Theatre website.